Recently Remodeled, Amazing Views & Steps Away from the FREE Shuttle! Treat yourself to a luxurious mountain getaway in the comfort of your own mountain home. With 360 degree views, including Mt. Crested Butte and the Maroon Bells, you can’t help but relax in the mountain air. 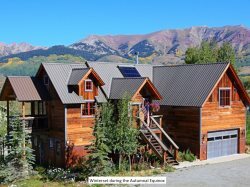 Newly remodeled, our home is located only a few blocks from the base area, and two miles from the town of Crested Butte. On the shuttle line, you have easy access to skiing, snowboarding, and the numerous superb restaurants in town and on the mountain. After a fun filled day of skiing, hiking or fishing, relax in the jetted bathtub or enjoy the view from the deck. If you like to cook, you’ll be inspired in the gourmet kitchen with granite counters, gas stove and combo convection microwave. When you are ready to retire for the evening, with 5 bedrooms you can comfortably sleep up to 13 people. TV Cable/Satellite: No, but there is a smart tv in both living areas. We had a fantastic Christmas gathering in this lovely home. Everything was perfect and we had everything we needed and then some! The property was wonderful. There was a fantastic view from every window in the house! The layout was perfect for a large group. Everyone loved it and we plan to rent it again next year! If you could provide concierge help in making restaurant reservations for your house guests, that would really be a benefit. We had a tough time getting dinner reservations as we didn't make any until we got to Crested Butte.